The AmazonBasics High-Back Executive Chair is a simple, but elegant solution to your office furniture needs. It doesn’t have any standout features, but it does offer a great price. When you’re looking for an affordable office chair, you want to buy from a brand you can trust. After all, if something happens, you need to be sure you can get a replacement. Our AmazonBasics High-Back Executive Chair review will help you decide if this chair meets your needs. Join us as we look at the chair’s features, the AmazonBasics brand, as well as the pros and cons of this office chair. Amazon is an extremely recognizable brand, but have you heard about AmazonBasics? This segment of the Amazon brand has been growing exponentially since it was launched in 2009. The concept was to sell low-cost generic versions of accessories like cables or plugs. With success, the brand expanded into all kinds of products, including office furniture. What started as a few hundred products has ballooned to over 1,500 in recent years. With the backing of Amazon as a whole, alongside their 1-year warranty, trust is not an issue when it comes to this office chair. With the brand question out of the way, this office chair essentially provides a basic setup for an excellent price. You won’t find any unique ergonomic features here, but what you will see is a sturdy and reliable chair for a price well beneath $150. Join us as we look deeper into the features that it offers for your needs. It all starts with quality materials. The bonded leather and PVC in this chair offer a look and feel like leather, without the cost associated with it. While bonded leather is something that customers have mixed feelings on, it’s often found in budget-friendly office chairs. Both the seat and back feature contoured cushions for support and comfort. There is also padding on the armrests, which is always a nice touch. A simple pneumatic handle beneath the chair allows you to adjust the height between 41.34 and 45.08 inches. Just remove your weight from the chair to go up, and adjust while sitting to go down. The AmazonBasics High-Back Executive Chair features full 360-degree swivel for ideal mobility. The nylon casters also offer a durable and smooth method of movement while seated. The chair provides a tilt and tension knob that lets you decide if you want the chair to rock or stay stationary. For a price point beneath $150, the AmazonBasics office chair is a wonderful solution. The bonded leather and PVC make for a long-lasting chair. Some customers have reported that it still works well after five years! The padded armrests are a small, but welcome feature. It’s difficult to rest your arms on solid material all day long. Unfortunately, with the lower price point comes a lack of advanced features. The presence of height adjustment, as well as tilt and tension locking,are all very welcome. There is no dedicated or adjustable lumbar support, however, and the armrests are not adjustable either. The weight capacity is also 250, which isn’t very high when you look at other high-back office chairs. Despite all of these things, there’s no denying the value presented in this chair. It may not have all the high-end options that some of the more expensive choices showcase, but it does have sturdy design and durability to last for several years. 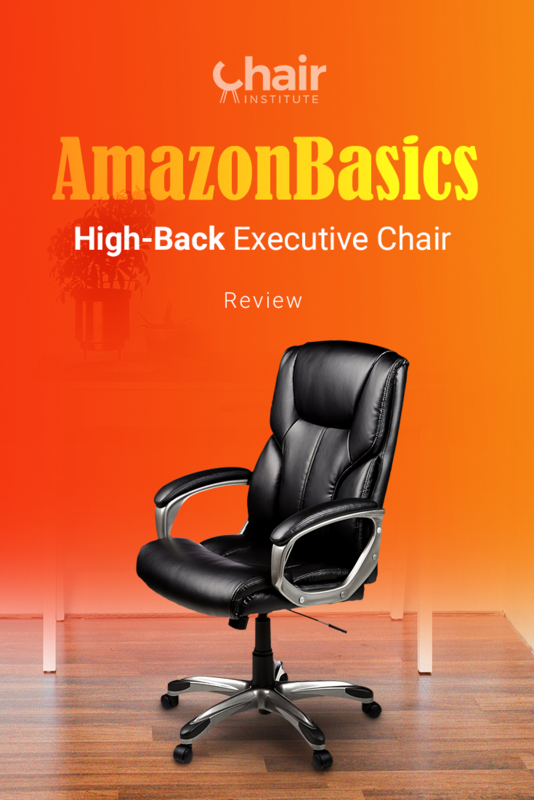 This AmazonBasics High-Back Executive Chair review is a largely positive one, and that’s due to the excellent value this chair provides. We love seeing quality options for reasonable price points because it allows anyone to enjoy a durable and high-quality office chair without breaking the bank. Whether you’re in the market for something to replace your office’s chairs, or you need a new chair for a good price, the AmazonBasics Executive High-Back chair could be a great fit. Get the best deals for AmazonBasics High-Back Executive Chair... Click here. AmazonBasics Executive Chair, Official Brand Website. High-Back Executive Chair User Manual, Amazon. Ergonomic Features of Office Chairs, Chair Hero. Ten Tips for Improving Posture and Ergonomics, Spine-Health. Bonded Leather Sofas vs. Genuine Leather - What's the Difference?, Consumer Affairs.